Friday rolled around faster than normal this week, thanks to the Monday holiday. I guess technically time still passed as normal, but these short weeks kinda mess with your head. It's not just me is it? Since I've already started down the road to random, how about some fragments? For starters, I have a daughter in the house, and there are very few things that make me happier than having a daughter in the house. Unless it's two daughters in the house, but hey I take what I can get. She loves walking in the door and having her picture taken. In my defense, she looked so adorable and teacher-y in her navy blue dress with the cute necklace and shoes I couldn't help myself. 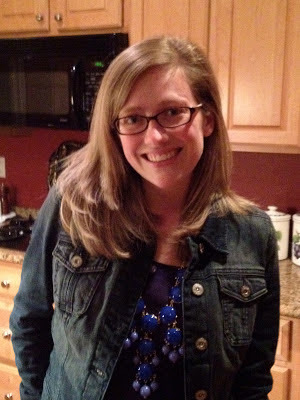 Speaking of teachers...if you haven't read this post (Worst End of School Year Mom Ever) by Jen Hatmaker, and you're a parent or a teacher hanging on by your fingernails just waiting for the school year to end, you should. It made me smile, and then my daughter came home telling me how her fifth grade students turned their classroom into a wax museum today, with all the kids in costume. Made me laugh, although she said the students all absolutely loved it and were really into their roles. Not a slacker parent in the bunch. Daughter2 is only home home for a week before she has to head back to uni and finish her final term in grad school. Not a long visit, but we'll make the most of it. Time flies when you're having fun, right daughter2? She might not find that funny with a summer full of classes looming large, but I am super proud of how this girl always puts her nose to the grindstone and gets things done. Hubs collected her from the airport last night (flight delayed, of course), and then I met them at the diner for dinner because that's what we do on airport pickup days. Not a lot of options for dinner at 9 PM in tiny town unless of course I were to cook. Right. Who wants to cook at that time of night? 9 PM on a Thursday night is practically Friday, and I think it's been well established here I don't cook dinner on Fridays. This morning daughter2 will have to rise and shine at the crack of dawn. Or rather, at what she considers the crack of dawn, but which in fact is not even close to the actual crack of dawn. She's going with me to help make and serve lunch at a nearby soup kitchen today, and lunch must be prepared at the 'crack of dawn'. Next week we'll do some shopping, and some lunching, plus I've recruited her to help me bake desserts for my gourmet group, so we'll keep busy. We wanted to pick strawberries, and normally this would be the right week, but the weather has been so cool they're not expected to be ready. We'll see...it's pretty hot and humid here now. We have some fun weekend plans involving a nephew turning seven. Daughter2 has never been in town on his actual birthday ever, so this one will be extra special. And finally, today my sweet niece celebrates her birthday. 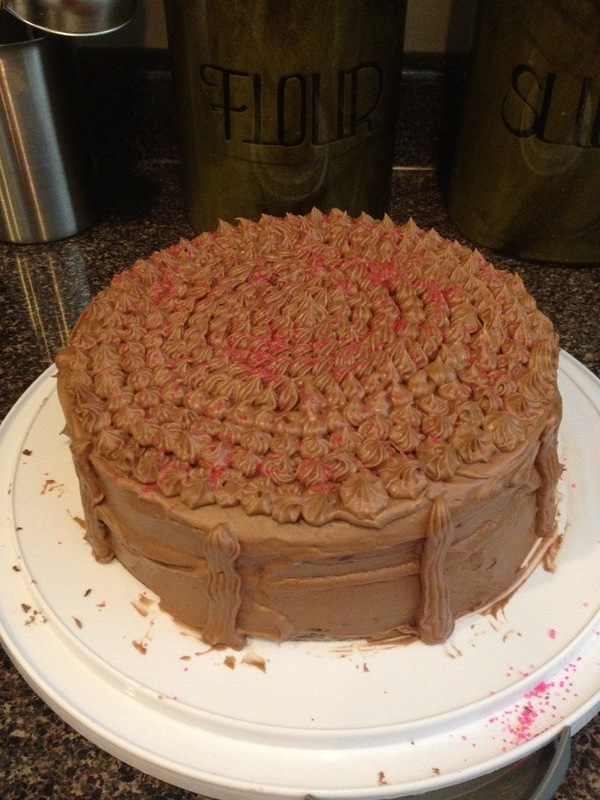 FYI-we like to bunch our birthdays up around here. 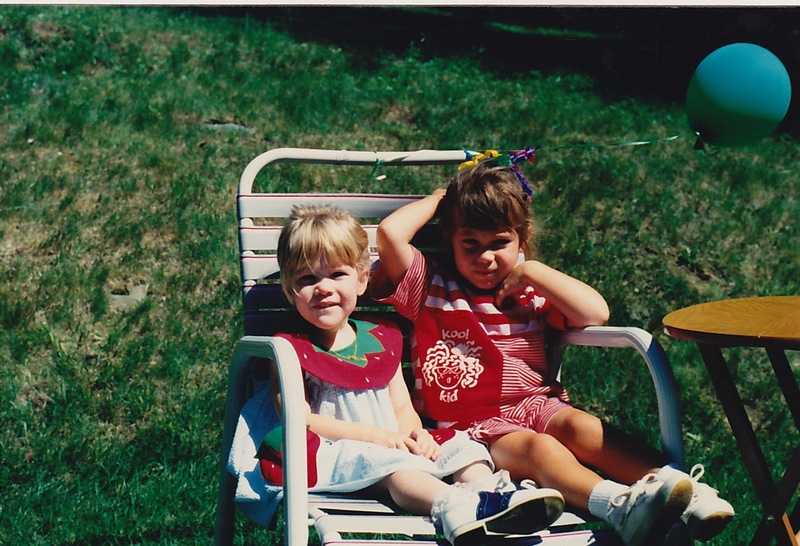 Daughter1's birthday is only a week away, and when they were little the two girls often had joint family parties. 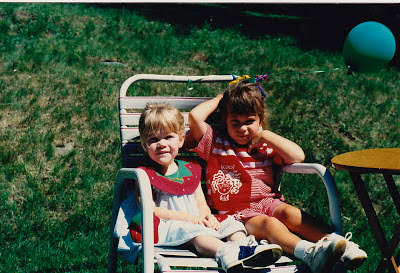 I found this snapshot from way back when, my niece's 4th birthday and Daughter1's 3rd birthday party held in our backyard. This one had a little Mermaid theme and they both got Cabbage Patch Dolls and hot pink jellies. The 90's were fun, weren't they? 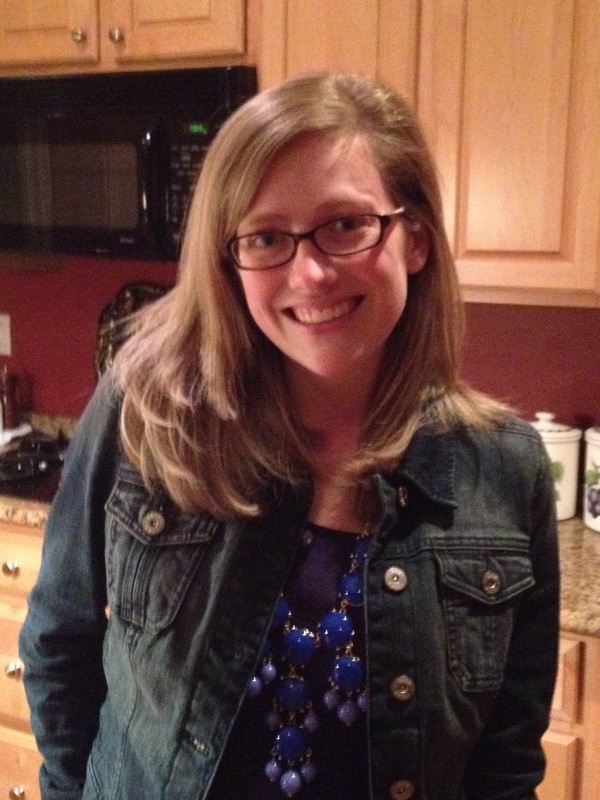 Smart and funny too...Happy Birthday Miss K! For more Friday Fragments, or to add your own, visit Half Past Kissin' Time. I know it's Thursday (it is Thursday, right?) and a new weekend is just around the corner, but I still need to talk about last weekend because I missed the blog window on Monday. Then there was the Hodgepodge to deal with, so here it is Thursday and I'm talking about last Friday. If you think about it you'll see it all makes perfect sense. Gotta love a fun uncle! Anyway back to Friday...we stopped at Cabela's en route because there's not one in our tinytown, and holy moly was it ever busy in there! The store was absolutely mobbed and many of the shelves were wiped clean. In fact there were so many people shopping that if you were there to purchase a firearm you had to take a number, kinda like you do at the deli counter. A snapshot of America in 2013. We do have more than a few varmints in these parts, but maybe what's out there in the dark of night needs to stay out there in the dark of night. We got to Maryland around dinner time, and my sil grilled chicken while we caught up on life. 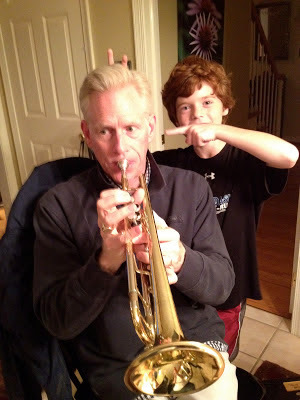 Hubs needed to refresh his trumpeting skills while we were in town, and my nephew critiqued the performance. Now, about the weather...it was cold. I mean actually cold.When we got out of the car at Cabelas we nearly blew away, and the thermometer read 44 degrees. Huh? Memorial Day weekend, right? It remained chilly and a little breezy on Saturday, but we didn't let that stop us from getting out and about. The boys wanted to take us to a nearby nature center where they volunteer so we did that Saturday morning. Come to find out nature center is code for 'place where snakes live', which made hubs supremely happy. I recovered though, mostly by swiftly handing off the slimy slithering creepy crawly to someone who actually enjoys handling snakes. A lot of anti bacterial soap, followed by lunch at Chipoltle made everything all right again. Now that's my kind of critter, especially seasoned, boiled, and ready for picking. 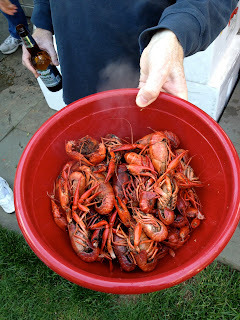 My sil and bil had friends hosting a crawfish boil on Saturday night and we were invited to join the party. So delicious! Yes, I'm wearing jeans and a fleece. It was still cool and breezy, but lots of fun. Pretty much how we spent the entire day. Hubs took a break from sitting to play some keep away, and catch, and 'let's see who can throw the ball highest' kind of activity, but mostly we soaked up the sun and gabbed. It was a good day. We went downtown Sunday evening and had a fun family dinner at a restaurant called Family Meal. The restaurant is owned by Bryan Voltaggio, the runner up in Top Chef back in 2009. He came in second to his brother Michael, and wouldn't a holiday dinner at their house be fun? Anyway, it's family meal kind of food, and really good. We had chicken pot pie fritters as a starter, and I need to figure out how to recreate that dish because they were scrumptious. It seems like most of the time we spend with our extended family centers around an event or a holiday occasion, so it was really nice to have a weekend to sit in the backyard, catch up, and see the world through the eyes of boys. Boys who, by the way, are somehow not so little anymore. Here we are again, smack dab in the middle of the week, although it feels more like Tuesday don't you think? Monday holidays always throw off my internal calendar. You should know it doesn't matter if you answer on Tuesday or Wednesday or some day later, just answer. And link! Don't forget to add your link! But that first question is one I ask myself pretty often too. 2. Do you grow roses? What's your favorite color of rose? Ever been given a dozen roses? 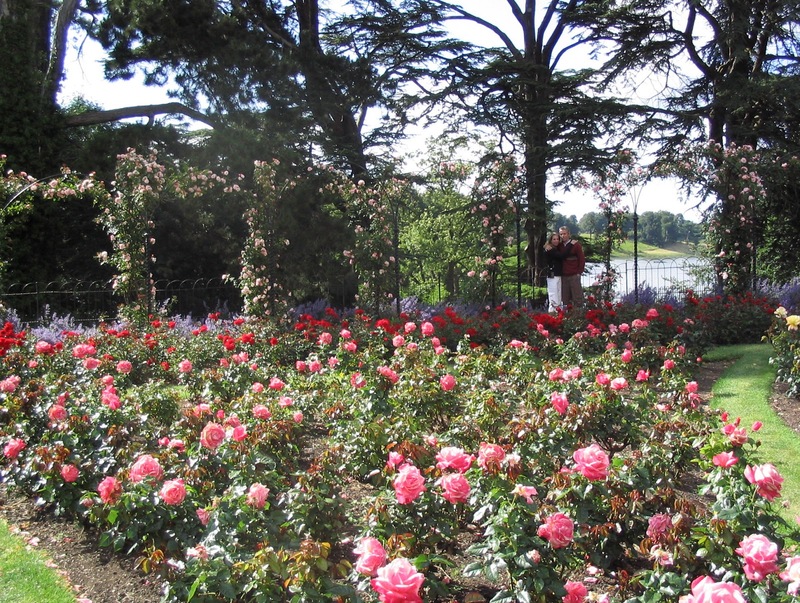 Where was the prettiest rose or rose garden you remember seeing? We don't have any rose bushes in our yard, but I'd really like to plant one or some. You need more than one I think. I was at my sister in laws this past weekend and she had beautiful yellow roses climbing up her deck. My favorite color rose is either yellow or the peachy pink. The yellow typically don't have the scent some of the others have, but I do love their color. I love being on the receiving end of a dozen roses and have been many times throughout my married life. Hubs knows how I feel about fresh flowers. I think roses are beautiful no matter where they grow, but I especially love the Queen Mary Rose Garden in Regent's Park, London. 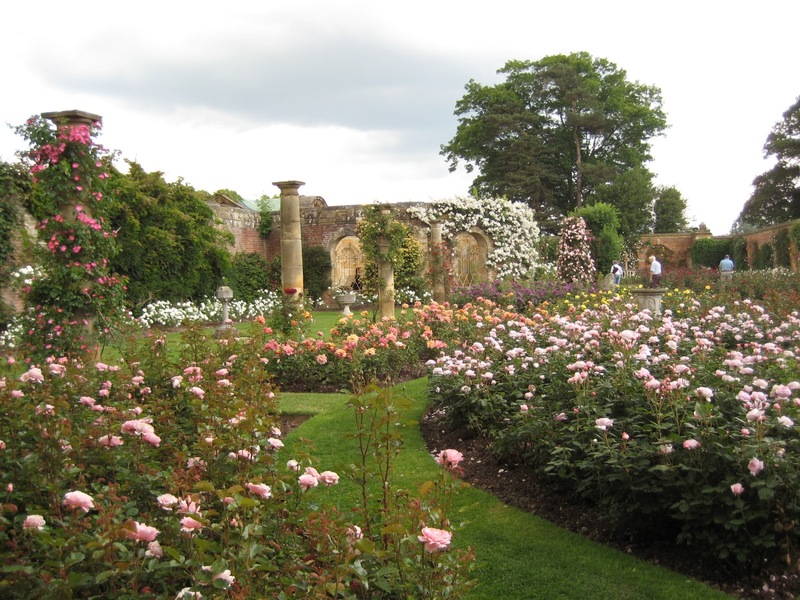 The rose garden at Blenheim Palace isn't too shabby either. Suffice it to say there's no shortage of beautiful roses in gardens all around the UK. 3. 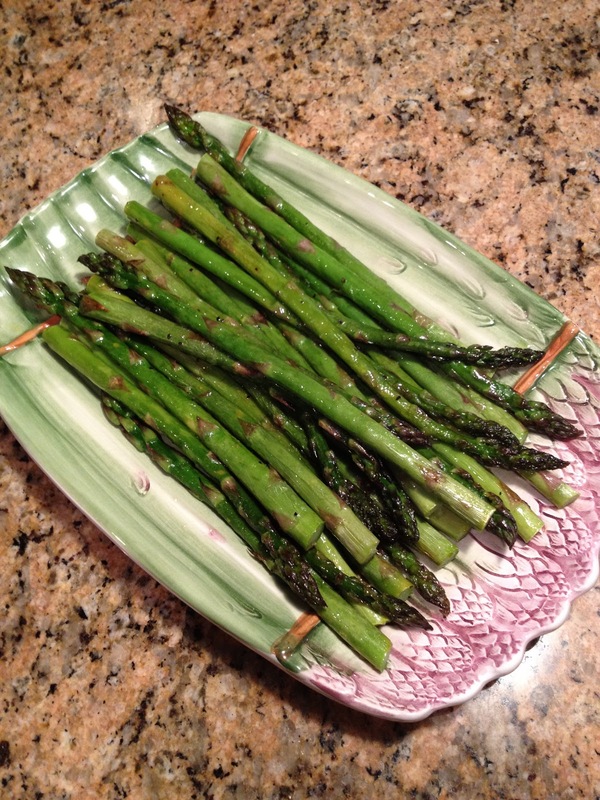 Do you read the freshness dates on grocery store products? Will you use eggs past their 'use by' date? Take medication that's expired? Buy a dented can? I definitely read the dates on grocery store products and never buy dented cans. It annoys me if I get home and discover I bought one by mistake. Eggs typically don't last beyond their 'use by' date around here, so that's never been an issue for me. As far as expired medications go, sometimes I'll go ahead and use them. Nothing with a long ago expiry date as I assume its effectiveness is reduced, but something close to expiry I'll most likely use. I think in the eyes of children they always have been, and likely always will be, and that's what matters. For better or worse. Why is it so often 'worse'? Kids look up to athletes and as such I'd love to see athletes rise to the occasion. Some do...just recently Kevin Durant of the Oklahoma Thunder donated a million dollars to tornado relief efforts in that state. I'm a fan of Tim Tebow too...his charity does wonderful things for sick and abandoned children and I like to see athletes (and celebs) using their fame for good. There are many athletes out there doing all sorts of things for charities close to their heart. I wish we heard as much about their 'escapades' as we do the ones that involve breaking the law, talking smack, and in general displaying bad manners for all the world to see. 5. Edmund Hillary of New Zealand and Tenzing Norgay of Nepal became the first explorers to reach the top of Mt. Everest on this date (May 29th) back in 1953. What's something you hope to achieve in your lifetime? My name on something in print. Build the family compound my hubs is always talking about. He's only half kidding and I'm on board. We'd have a cottage for my mom, and one for my in-laws, plus a house for me and the hubs. Then a couple of houses for my girls and their eventual families, and maybe a guest house with a ginormous kitchen/dining space for big dinners with friends and holiday gatherings. Oh, and I'll be needing my 20 acres near the water please. I'll be there close to 7PM. Definitely not before 7, but I won't stroll in an hour after either. It goes against my grain to be late, even fashionably so. I don't like to be the first one to a party though, so probably ten or fifteen minutes after the start time. Unless of course it's something requiring 7PM prompt. Then I'll be prompt! I was thinking about some of the pretty rose gardens I've visited, and remembered another favorite and familiar spot I should have mentioned-my girl's university. There is an absolutely gorgeous rose garden in the middle of campus...a perfect spot for taking graduation pictures which we've done on two separate occasions now. We'll be snapping a few more pics when we're back on campus in August. Daughter2 will be receiving her Master's Degree, and I'll once again be sniffling my way through Pomp and Circumstance. I'm going to miss this place. I'm a little late posting this week's questions, but I was out of town over the long weekend and didn't have the mental energy required for publishing last night. 5. Edmund Hillary of New Zealand and Tenzing Norgay of Nepal became the first explorers to reach the top of Mt. Everest on this date (May 29) back in 1953. What's something you hope to achieve in your lifetime? I do have a bicycle. It's hanging on the garage wall and would definitely need a tune up if I wanted to ride. Which I don't, because seriously it's steep here. Even walking in my neighborhood is tough on the knees. When did I last ride a bike? It's been a while, unless you count the stationary bike at the gym I pedal for miles every week. My last ride on a 'real bike' was probably the first summer we were back in the states ('09). We spent a weekend at a friend's lakehouse, and she had one of those cute bikes you see people riding in beach communities...I loved it. Looking back I'm not sure I can separate what was learned strictly in school from what was learned elsewhere. I think most of my life lessons came from the combined experience and interaction with all the people who lived and grew beside me, not just in school, but also those in my own family, my church family, and my neighborhood. I do think my sense of empathy for the underdog was forged a bit in school. I think it's been well established we're adventure eaters here, so I'm struggling to come up with something I want to try but haven't. I know there are millions of ethnic foods eaten regularly in kitchens around the world that I don't even know about so I'm certain the list would be long. If I'm traveling and you offer me something local I'll generally give it a try. As far as something I've tried and will never try again? Liver and onions. I haven't had this dish since I was a kid, but the smell of it cooking is indelibly etched in my brain. It's possible this is one of those foods I disliked as a kid, and would now love as an adult, but I cannot get past the childhood memory. Maybe if it were served in a restaurant and I didn't know what I was eating? I'd say more. I've been really serious about exercising regularly in recent weeks, plus I'm working on meeting some personal goals that require more self discipline than I typically posses. I'm pushing myself a little more than normal and that's good. For the time being, anyway. Hmmm...in other words, who do I love to hate? I did love Larry Hagman as JR Ewing back in the day, but I think I'll say The Wicked Witch of the West. That green face and terrifyingly creepy little laugh still kinda gives me goosebumps. It doesn't keep me up at night, but it's definitely on my radar. Sadly in this day and age everyone needs to be vigilant in reviewing bank and credit card statements and in safeguarding passwords and pin numbers. I think bank and card companies are working hard to get to the fraud before it impacts the customer, but that's not always possible. 7. I saw this last question on Dawn's blog and asked if I could share. Everybody hop over and say hi, but first answer this...would you rather have an ordinary home in an extraordinary place or an extraordinary home in an ordinary place? Definitely an ordinary home in an extraordinary place. I'm all about a great location! Here are the questions for this week's Wednesday Hodgepodge. Answer on your own blog, then hop back here tomorrow to add your link to the party. 3. What's a food you've never tried, but want to try? What's a food you've tried and will never try again? 7. I saw this last question on Dawn's blog a couple of week's ago and asked if I could share. Everybody hop over and say hi, but first answer this...would you rather have an ordinary home in an extraordinary place or an extraordinary home in an ordinary place? When my daughter2 was in the 6th grade she got into some sort of very minor mischief at school, and as a consequence had to eat her lunch one day at a 'special table' up on the stage. Mischief sounds far more ominous than what actually occurred, and in fact I cannot recall now what even happened. I feel certain it involved talking when she shouldn't have been talking, but I think there may have been some hurt feelings along the way too. Anyway, that's not the point. The point is this-I found out. To this day my now grown up daughter doesn't know how I found out, but I think we can all acknowledge mothers have their ways. She had never been in any trouble at school, and while the action was very minor my concern was the bigger picture. One bad decision often leads to another bad decision and that's a lesson some of us never seem to learn. I needed my daughter to understand that we make choices and there are always consequences, for good or ill, to the choices we make. I also wanted her to understand that when the people we interact with on a daily basis are making bad decisions, doing/saying nothing is every bit as much a choice as agreement. I don't want my children doing nothing when they can do something. When my daughter came home from school that day she carried on as if nothing had happened, so I casually asked, 'Did anything interesting happen at school today?' She gave me some bit of unimportant trivia as middle schoolers and errant politicians are apt to do, but then I looked her in the eye and asked again, "Did anything happen at school today that you'd like to tell me about?" As the wheels spun I added, "Think really hard before you answer." We've all been there, standing in my daughter's shoes in front of a parent, a boss, a taxpaying citizen of the United States, and run through our list of possible responses. Why is our first instinct almost always for denial instead of the simple or sometimes complicated truth? My daughter weighed her options, put her head down, and spit out the facts. More than ten years have passed since that day, and while I don't remember the details of what led to our face to face, I do remember this-she didn't deny it. It was only in facing the cold hard facts that we were able to have an honest conversation. We looked at what led up to her making a bad decision, and how to avoid that the next time she's in a similar situation. There was genuine remorse on her part, and genuine forgiveness on mine. Forgiveness comes so much easier when we deal in truths. When we don't have to wade through what is real and what isn't, what we can believe and what is being said to make a situation look less awful than it actually is. Partly what led to the day's misfortune was the particular small group of girls my daughter had decided to hang with that day. They weren't her close friends, they were a handful of girls known to all the moms (and staff) in her grade as girls who tested the limits at every turn. My daughter was invited to sit with them that day, and while she told me she didn't actually do whatever it was they were punished for, she was guilty by association. My daughter did try to tell me that what she got in trouble for wasn't nearly as bad as what X got in trouble for. Ha-does any parent ever buy that defense? My reply to that line is always the same...just because someone else did something you see as far worse does not mean what you did wasn't also wrong. We don't hold ourselves up to the lowest common denominator. Note to 11 year old girls and people entrusted with our country's security, finances, and most of all, our trust-who you surround yourself with matters. We talked that day about what my girls will tell you is one of my favorite, and most used words in parenting, and in leadership-perception. It matters when you're an eleven year old girl opting to throw your lot in with girls you know are on a teacher's radar, and it matters when you're the President of the United States and things are spiraling in a thousand downward directions around you. I don't care if you're running a multi-million dollar corporation, the United States of America, or the local PTA...when you're the one in charge perception matters. You are it. The one. Where the buck stops whether you like it or not, asked for it or not, deserve it or not. The one word I want most associated with my children and my husband and most of all, the leader of my country, is integrity. That word is defined as 'adherence to moral and ethical principles, soundness of moral character, honesty'. If a leader lacks integrity, what good is he/she? Standing in my kitchen that day, in spite of my annoyance, something pricked at my heart. I realized that while I wasn't proud of what led us to the little tete-a-tete, I loved and respected my daughter's willingness to tell the truth. She owned up to her part in whatever happened, claimed responsibility for a bad decision, and for allowing the people around her to carry on without saying, 'hey that's not right'. Our President and much of his staff could learn a thing or two from an eleven year old girl brave enough to stand eye ball to eye ball with a disappointed mother. I'm giving Five Minute Friday a try again this week. The instructions are simple-write for five minutes flat for pure unedited love of the written word. Link back to Five Minute Friday and invite others to join in too. Consider yourselves invited. Finally, be generous and leave an encouraging comment for the person who linked up before you. It's that time of year where something in the air assures us summer is just around the bend. Growing up I spent my summers at camp, first as a camper and later as a counselor. I remember the welcome hush that fell over a cabin at nighttime. Girls in my care, full of words and laughter and questions, finally drifting into slumber. Days were lived outdoors in the summers of my youth. We swam and sailed and paddled, made the uphill climb from the waterfront and ran to capture the flag. We yelled 'red rover red rover come on over' under a sun drenched Chesapeake sky. I remember the exhale at the end of a day. Crawling in to my sleeping bag, the sound of night all around. Sometimes I slept on top because this was camp, and the only air conditioning was a warm sticky breeze inching its way through a tightly woven screen. The only night light, a summer moon. It was a good tired. I closed my eyes and let the day fall away. It was always in this space between wake and sleep that her song began. Not a softly whispered lullaby suited to the quiet place where day ebbs into night and back again. Her song was loud, clear, distinct...a single line repeated over and over, winging it's way over and under and through a night forest. It seeped into your head and before you knew it you were singing it too. There is no mistaking the song of the whippoorwill. She's a bird named for the song she sings. Onomatopoeia. A lonely sound, ethereal... she calls but no one answers. Mostly though, it was aggravating to an exhausted nineteen year old girl trying to sleep in a cabin in the woods. I'd pull my pillow tight around my ears, trying somehow to block the unblockable. Decades roll by and memory piles upon memory. Every once in a while she calls to me still...different woods, same sad song. When I hear her sing the years fall away, and I go back to that place where dreams were planted and roots took wing. The place where tall trees kissed the bay and God felt close enough to touch. Where the whippoorwill sang on a moonlit summer night. Yesterday I went with some friends to the New Jersey State Botanical Garden at Ringwood State Park. I'd never been before, but its been on my list ever since hubs and I saw the entrance when we vistited the State Park a few months back. The Garden sits on property that Francis Stetson assembled from pioneer farmsteads back in the late 1800's. Stetson was a New York lawyer involved in the incorporation of railroads and U.S. Steel. He was a trustee of the New York Botanical Garden and named his country estate Skylands Farm. He kept a mansion made of native granite, a working farm with more than 30 out-buildings, gardens and a lawn that doubled as a 9-hole golf course. In 1922 Skylands was sold to Clarence Lewis, an investment banker and a fellow trustee of the New York Botanical Garden. 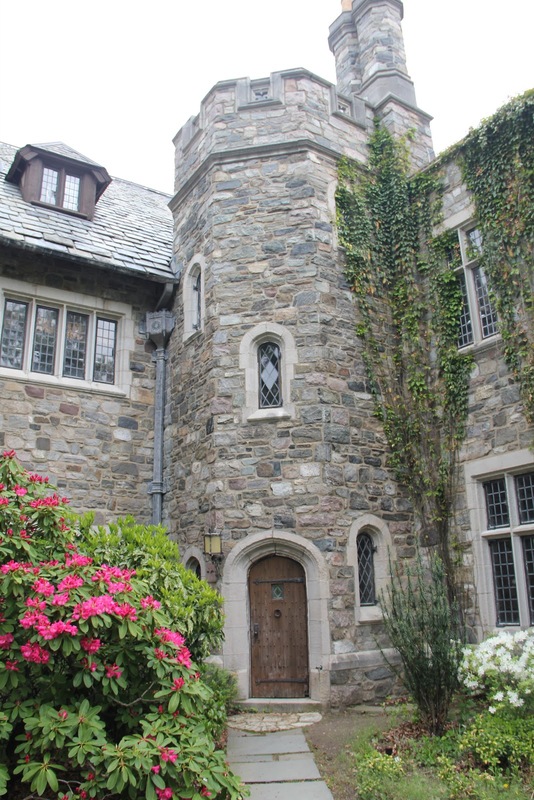 He tore down the original mansion and replaced it with the Tudor style home there today, also made of native granite. In 1966 New Jersey purchased the more than 1,000 acres from Shelton College which had used the property as a campus, and in 1984 Gov. Kean designated the central 96 acres surrounding the manor house as the State's Official Botanical Garden. The weather yesterday was gray and chilly, but thankfully the rain held off. We'd gone specifically to see the lilacs because they're supposed to be at their best mid-May. There are over 100 varieties of lilac in the Skyland collection, and are definitely one of my very favorite flowers. Trees? Shrubs? Technically I think they're shrubs, but they grow to look like trees. Lilacs make me think of my back garden in England. We had a purple lilac, and a white lilac, and the scent when you stepped out back was incredible. I used to snip the blooms and set them on my kitchen table. I need a lilac tree. It's funny how a particular plant or flower can invoke a memory. Iris are the Tennessee State Flower and we saw some of those yesterday too. They also make me think of my childhood and the amazing iris bed my mother grew every spring. It sat at the corner of our yard and the iris grew nearly as tall as my nine year old self. We had iris in our backyard pond in the UK and I can't help but remember that favorite space too, whenever I see a purple iris. ...and made a mental note to come back when they're in bloom. I had no idea how massive the property was. Lots of paths through the woods to explore, benches made for sittin' a spell, and something pretty at every turn. Is there anything more lovely than a peony? Mary Mary quite contrary, how does your garden grown? 1. May is National Blood Pressure Month...what sends yours soaring, either literally or figuratively? What calms you down? When did you last have your bp checked? I've written more or less the same answer to this question multiple times, trying different wording each time, but in the end deleting it altogether because it felt like I might be raising a topic that would make your blood pressure soar. You're welcome. Let's go with the general answer of politics and leave it at that. Simple-turn it off. The news, the television, the car radio, the multiple social media outlets. Do something else. I might go for a walk, cook, read, listen to music, watch a movie...anything really. Hey, I might even vacuum. I have my bp checked several times a year, because once you've cruised past your 45th birthday people, its all just fun and games. 2. You found $1-what do you spend it on? $10 $100? 1$-I'd probably stick it in my wallet. 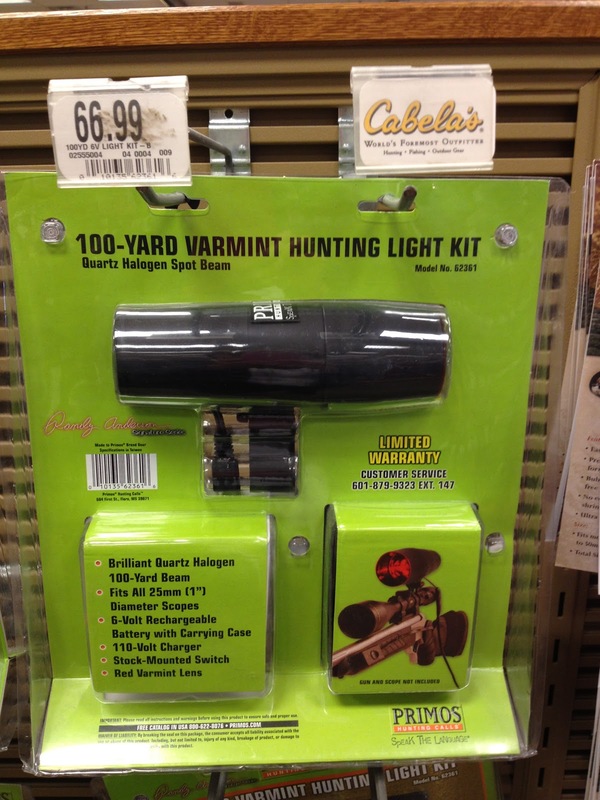 Can you actually buy anything with a buck? 3. Mandatory labeling of genetically engineered (GE) food has been proposed, but not yet enacted in the US. How much attention do you give food labels before you buy? Are you in favor of labeling if it means higher prices? Is this an issue you've been following and feel strongly about, or is this the first you've heard of the controversy? I pay a fair amount of attention to labels because we obsess over carbs, sodium, and sugar these days. I buy organic when I can and straight from the farmer whenever that's possible. I live in the NJ countryside so around here that is very often possible. I've read quite a bit about the GE foods and while my instinct is to say absolutely slap a label on everything, it's not quite that black and white. For instance there is debate about what technology would require labeling, what percentage of GE must be present to require labeling, how is it regulated, etc. Cost is definitely a factor for most people when purchasing groceries. I often stagger out of the market in a daze, receipt in hand, trying to mentally figure out how what I just purchased cost as much as it did. I feel for families regularly trying to feed growing children on a budget. 4. May 15th marks the birth date of Frank Baum, author of The Wizard of Oz. At this point in time are you more in need of brains, courage, heart, or a trip back home? Explain. I have some personal goals I'm attempting to meet so I'm going with courage. They're not extraordinary, but they do require me to be a little bit brave and a lot disciplined. 5. "There's no place like home" is an oft repeated line from Baum's book. When was the last time you felt the truth of that statement? Every time I return from a trip out of town, which if you read here you know is pretty often. I love to travel, love to visit family and friends and foreign cities, but I also love to come home. No matter where it is, there is no place like it. 6. Steak-yes please or no thank you? What cut do you prefer and how do you like yours cooked? Sauce or no sauce? Besides your own kitchen where's a place you like to go to get a great steak? Yes please, just not too often. I like a petit fillet if we're dining out, and a cowboy cut Ribeye we get from someone here if hubs is grilling. We call it the Fred Flintstone steak because it reminds us of those ginormous steaks Fred used to eat that tipped his car on its side. Definitely no sauce. Just the steak, charred on the outside and medium rare on the inside. Sorry all you vegetarians reading here. Just writing that description of a great steak confirms for me why I'll never be a vegan. There are any number of fabulous places to get a great steak, but I especially love Sparks Steak House in the city. I needed to be somewhere at 10 am on Monday morning. Hubs was working from home until he needed to leave for the airport, and just as I was getting ready to walk out the door he asked me to print his boarding pass. There was some sort of mix up that required phone calls and waiting on hold, and then more waiting on hold before it was all sorted, so I ended up running a little late. Running late makes my blood pressure soar. I could have just said that for #1, because I hate to be late. I wasn't really late, more like right on time. Which is the same thing as late in my book. Who's a fan of the show 24? Fox TV announced this week they're bringing it back, summer 2014, and Keifer Sutherland will once again remind us that our own day wasn't so bad after all. 24 was some of the most intense programming I've ever seen, and Jack Bauer is still one of my all time favorite fictional heroes. To this day when we see Dennis Haysbert in anything we refer to him as President Palmer. Thinking about that show takes me back to some chilly UK springs and summers winters, short on daylight, but filled with lots of family togetherness. Many a winter weekend we'd all bundle up by the fire in our cozy sitting room and watch 'just one more hour' of 24. If you're a fan of the show you know it's impossible to watch 'just one more'. Hmmm...I think my girls are gonna need to plan for some marathon viewing here at home once the new season is released on DVD. We never ever watched it in real time. I mean, who could stand to wait a week to find out what happens in the next hour? Welcome to another week of random fun. You'll find this week's questions for the Wednesday Hodgepodge posted below...answer on your own blog then hop back here tomorrow to share answers. 3. Mandatory labeling of genetically engineered (GE) food has been proposed, but not enacted in the US. How much attention do you give food labels before you buy? Are you in favor of labeling if it means an increase in food prices? Is this an issue you've been following and feel strongly about, or is this the first you've heard of the controversy? 6. Steak...yes please or no thank you? What cut do you prefer and how do you like yours cooked? Sauce or no sauce? Besides your own kitchen, where's a place you like to go to get a great steak? The great Monday morning debate...do I write in great detail about every interesting or maybe not so interesting tibit from a rather ordinary weekend, or do I go with a list of all I loved and didn't love about a rather ordinary weekend? How about a list with details? It was an ordinary weekend. Other than the fact that it was Mother's Day of course, and if you follow me on any sort of social media you might have seen more of my face than you wanted. My girls made me feel like a rock star which had me smiling all day long on Sunday. I loved all the virtual love which made up a smidge for the fact that it was Mother's Day and my girls were elsewhere. I woke up Saturday morning 'on the wrong side of the bed'. Sometimes this happens, and when it does hubs wants to know what's wrong. Really nothing in particular is wrong. Or everything. I don't know. All I know is that the phrase mothers through the ages have been using to describe prickly children, applied to me on Saturday morning. I had a sinus headache and hubs was chipper. I don't normally go to the gym on Saturdays, but it was a gloomy day which suited my mood, so I took myself to the gym. Sometimes we just need a tablespoon of endorphins. Followed by a nap and movies on the couch all afternoon. 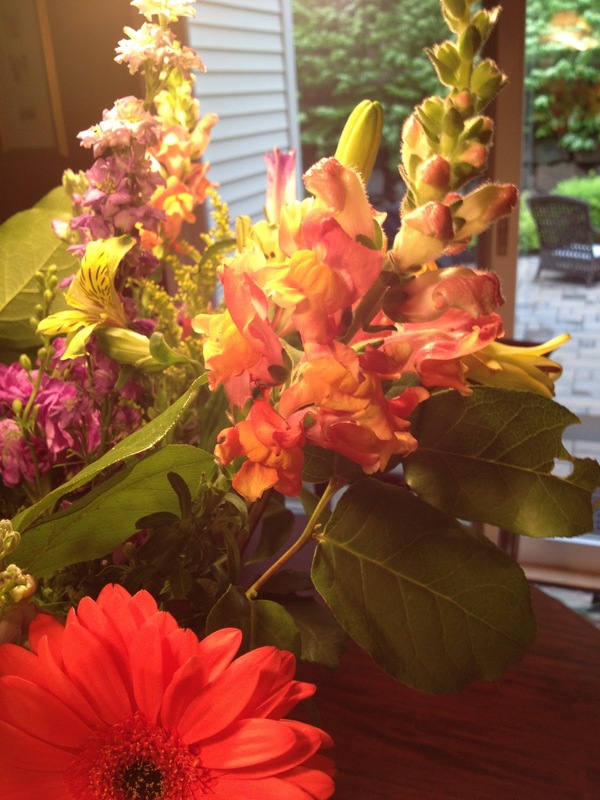 ~hubs walking in the door from work early on Friday evening with a ginormous bouquet of gorgeous spring flowers. In spite of their name, snapdragons are a happy flower don't you think? ~roasted vegetables...if you've never roasted cauliflower you're missing out on something delicious. Daughter2 fixed it this way when she was home at Easter and we're addicted. Cut your cauliflower into bite sized pieces, lay it on a baking sheet and coat with a little olive oil, some salt and pepper, and a healthy sprinkling of crushed red pepper flakes. Roast for about 15-20 minutes at 425 and enjoy. 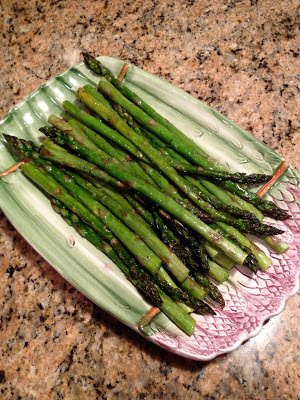 ~Italian pottery...asparagus tastes better when served on a dish made and purchased in Italy. That's a fact. 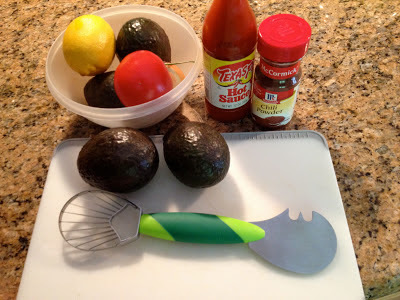 ~fun kitchen gadgets...anyone notice many of my weekend happies are food-related? Hubs picked up this fun little gadget that pits, cuts, and slices an avocado. I felt it was my duty to try it out so I made my famous guacamole Sunday afternoon, and a friend came by to spend a few hours with us, which gave me an added excuse. Not that I ever really need an excuse to make guacamole. 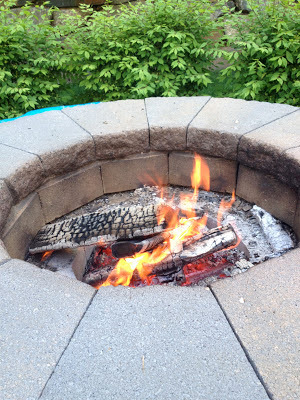 ~a springtime fire in the outdoor firepit...our first of the season. Finally! Guacamole eaten beside an outdoor firepit on a sunny, but cool Mother's Day afternoon, is extra delicious. ~sweet daughters...daughter2 went over to my sister's for dinner on Mother's Day, and she took flowers and a chocolate cake she'd baked. My sister has been a kind and loving aunt to my girls all their lives, but especially during these university years when she's been geographically nearby and I have not. I kinda wish I'd been at my sister's house for dinner yesterday. Or at least for dessert. Instead, hubs grilled me the perfect steak and then took me to a Rita's for an Italian Ice. I had a sugar-free rootbeer flavored kiddie cup. It's not chocolate cake, but it's still a pretty nice way to end a never ordinary weekend.